Provide comfort for the family of Agostino Gencarelli with a meaningful gesture of sympathy. Agostino Gencarelli, 86, of Oak St., Westerly, RI passed away on Wednesday, January 23, 2019 at The Westerly Hospital surrounded by his loving family. Born in Acri, Province of Cosenza, Italy, he was the son of the late Francesco and Immacolata Gencarelli. Agostino retired from The American Velvet Company after many years of employment and was a communicant of Immaculate Conception Church. He spent countless hours tending to his garden, plants, homemade sheds and greenhouses over the years. He loved to play cards with his friends as a lifetime member of the Hilltop Social Club. He could always be found sitting at the head of the table in his kitchen enjoying a Budweiser with his closest friends and family. He will be dearly missed by his children, Immacolata (Margaret) Luzzi and husband Angelo, Annunziata (Nancy) Didone, and Silvia Souder and husband Christopher, all of Westerly. 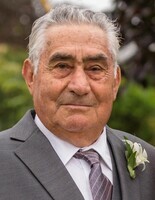 Agostino also leaves behind ten siblings, Natale Gencarelli and wife Bianca, Aldo Gencarelli and wife Terry, Nunziata Scavello, Rosina Gabriele and husband Francesco, Ninetta Ferarro and husband Antonio, Giovanna DeFranco and husband Giuseppe, and Lina Intrieri of Westerly, Luisa Gencarelli and Maria Gencarelli of Italy and Assunta Luzzi and husband Salvatore of Australia; seven grandchildren; and five great-grandchildren. He was predeceased by his wife Maria Gencarelli and brothers-in-law, Natale Scavello and Natale Crocco. To plant a memorial tree in honor of Agostino Gencarelli, please visit our Heartfelt Sympathies Store. We encourage you to share your most beloved memories of Agostino here, so that the family and other loved ones can always see it. You can upload cherished photographs, or share your favorite stories, and can even comment on those shared by others.